The digital repository ‘Observatory of the Refugee and Migration Crisis in the Aegean has been developed by EKT and aims to collect, organize and document a wide range of content connected with the refugee and migrant crisis in the Aegean. A very important digital archive, now open and freely accessible, documents the refugee and migration crisis in the Aegean. The archive is available through a digital repository, offered in both English and Greek, which organises and makes openly available content produced by the Observatory of the Refugee and Migration Crisis in the Aegean. The repository was developed by the National Documentation Centre (EKT), in co-operation with the University of the Aegean and is supported by the Wenner-Gren Foundation for Anthropological Research. The goal of the repository is to Showcase primary and secondary sources, produced and collected by the Observatory and ensure its free online availability to researchers, journalists and other interested parties, collectives and authorities. This content is particularly important for related research and the historical documenting of the refugee and migration question in the Aegean islands. The observatory is a valuable tool for anyone looking for authoritative information on the refugee and migration issue in the Aegean islands, providing a unique database of great value for researchers into the refugee and migration crisis. It is not only relevant to the migrant population, local communities and bodies of public administration and humanitarian governance, but also the wider Greek and international public interest. Its main aims are to collect, document, organise, preserve, digitalise and disseminate various categories of material associated with the refugee and migration crisis in the Aegean. The Repository also documents and promotes research conducted by members of the Greek and international academic communities. A wide range of content in various formats can be found in the repository, including personal experiences, diaries, published or un-published statistical and institutional records, studies on children’s rights and education for refugees, reports in the print and electronic media, photos, videos and other primary and secondary material. Focusing on the Aegean and, specifically, the five islands comprising the main gates of entry for refugees and migrants to Europe (Lesvos, Chios, Samos, Kos, Leros), the repository collects, processes, classifies and makes documents of diverse origins and types available in digital form. Most of the content available to the public covers the time period from 2015 (when the phenomenon was at its peak) until June 2017, in an attempt to provide a multi-faceted record. The Observatory of the Refugee and Migration Crisis in the Aegean is implemented and supported by the National Documentation Centre (EKT), through its Repository Services, as part of its co-operation with the School of Social Sciences, University of the Aegean. EKT’s repository services have been developed through the project ‘A Platform for the Deposition, Management and Delivery of Open Data and Digital Content’ ( Operational Programme ‘Digital Convergence’ NSFR), co-funded by Greece and the European Union- European Regional Development Fund). 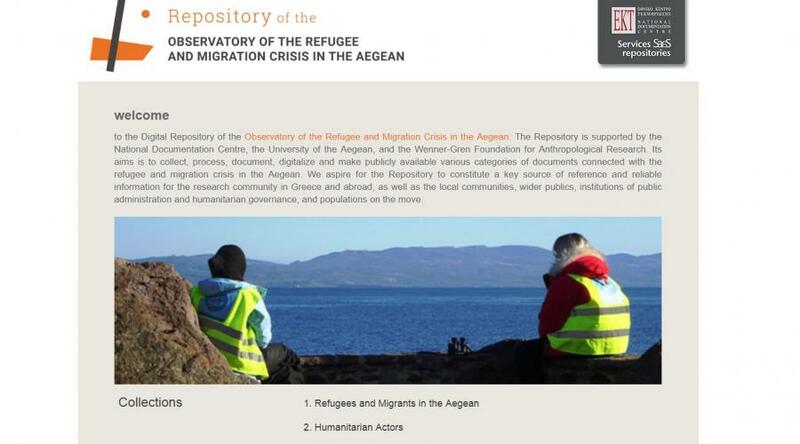 The repository was first presented in Mytilini on 28 November 2017 at the ‘Refugee Issue, an Intellectual and Political Challenge’, an event organised by the Observatory of the Refugee and Migration Crisis in the Aegean, Department of Social Anthropology and History, and the School of Social Sciences, University of the Aegean. During the presentation of the Observatory, the Director of EKT, Dr. Evi Sachini welcomed the action and participated in discussions on the mission of the centre with individuals from different positions with experience of governance of refugees in the Aegean.